The second ever 2 on 2 spiel at the club was held on November 6 and 7 with twelve teams taking part. Of the twenty four spiel participants, nine of those were female curlers which was great to see. Play got underway Friday night with the first draw at 7pm with the team of Nadine Neima Drover and Thomas Drover taking on Joe Erickson and Kelley Laughlin. Thomas couldn't make the game so Rick Windsor filled in. Windsor, half of the winning team from last season's 2 on 2 spiel with Wayne 'Bull' Bonnell, wasn't taking part this year due to the notable absence of Bonnell. Bonnell's reasons for missing the event and not defending the championship he and Windsor shared in the previous spiel were sketchy and unsubstantiated. The other game of draw one saw Jolene MacLellan and Lynette Chiasson taking on a second women's tandem in Lynn Kelly and Frances Ford. The second draw of the night saw Rick Billard and Greg Wall take on Walter Nichols and Anthony Boudreau on one sheet and Stephen Leslie and Sid Murray take on Peter MacIntyre and Bill Moss on the other sheet. Four teams were given byes for the first round and the winners of draws one and two were set to take on these teams later in the evening. 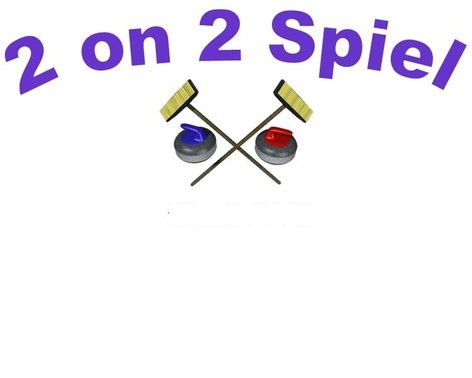 Since games in the 2 on 2 spiel are only six ends with each team only throwing six rocks without sweeping per end, games are quick and generally only take one hour to play, allowing for these draws to all be completed on Friday night. The third draw of the evening had Matt and Amy MacPherson take on game one winners Erickson/K. Laughlin. Wally MacDonald and Chris 'Slugger' MacLeod took on Winners MacLellan/Chiasson in that same draw. The final draw of the night had Gordie Cormier and Brian Laughlin take on Billard/Wall and Georgette Sparkes and Laura Rafuse took on Murray/Leslie. Losing teams on Friday night would start the day Saturday in the consolation bracket while teams who kept winning would stay in the top bracket and play for the overall championship. Play got underway on Saturday with the first two draws, 11:00 am and 12:00 noon, being made up of the eight teams who had suffered a loss on Friday night. Play switched back to the top bracket at 1:15 for two semi-final games, one having Joe Erickson and Kelley Laughlin take on Wally MacDonald and Chris 'Slugger' MacLeod and the second one seeing Gordie Cormier and Brian Laughlin take on Stephen Leslie and Sid Murray. The winners of this game would play for the overall championship and the losers would be dropped to the semi-final of the consolation division. MacDonald/MacLeod and Cormier/B. Laughlin were both victorious, setting up a showdown in the spiel's final draw between these two teams for the overall title. Erickson/K. Laughlin would end up playing Nadine Neima-Drover and Thomas drover in one consolation semi-final while Leslie/Murray would take on Walter Nichols and Anthony Boudreau in the other, winning teams playing for prizes, losing teams being finished. Both Leslie/Murray and Erickson/Laughlin came out victorious in their games and earned their way into the consolation finals and the right to play on for a share of the prizes. In the consolation final it was the team of Joe Erickson and Kelley Laughlin defeating Stephen Leslie and Sid Murray to take home that title and third place overall. The championship final was a tightly played game that saw both teams trade points throughout the game and wound up with everything riding on the final end. MacDonald and MacLeod kept the house clean for a chance at scoring with the all important hammer. The strategy worked when MacLeod was left with a draw on his final stone that could win the game for his team. MacLeod was not, however, up to the task and left his draw light, leaving the score tied and forcing and extra end, an end that saw Cormier/B. Laughlin score and steal first place and the championship title away from MacDonald and MacLeod. Truly a disappointing defeat. The Spiel, however, was anything but disappointing with lots of great curling and lots of fun had by curlers and spectators alike. The 2 on 2 game is gaining popularity and is enjoyed by almost everyone who tries it. if you missed out on this spiel and are regretting your choice, there will be another opportunity for you to take part in early April when another 2 on 2 event will be held. Make plans to sign up. Rumor has it that Wayne 'Bull' Bonnell will actually be back to take part but that remains to be seen. To top off the great weekend of 2 on 2 curling there was a dance held at the club on Saturday night with music by DJ Jimmy. About twenty members and guests partied the night away and had a great time. Thanks to everyone who took part and to everyone who helped out in planning and running the weekend 2 on 2. Hope to see you all back in April.